The 10 thematic units of Oral Language Builder provide young ELL, French, and Spanish learners with fun and engaging ways to build communicative competence in a new language. The 10 independent Oral Language Builder kits build social and content-related language through topics students can truly relate to. 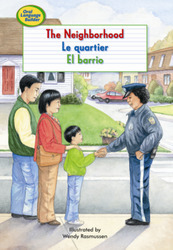 As Masumi walks with his parents to his new school, he learns about places in his new neighborhood from friendly community helpers.